The majority of exciting Celtic rock bands have come from Ireland or Scotland, but the United States has given us some as well -- for example, Milwaukee's Reilly and the New York City-based Black 47. And on Bankers and Gangsters, Black 47 once again demonstrate that their perspective isn't strictly an Irish perspective, but also, an Irish-American perspective. In fact, this 2010 release is full of references to the Big Apple. "Izzy," for example, takes a humorous look at the interaction of Irish immigrants and Jewish immigrants on Manhattan's Lower East Side and uses both Celtic and klezmer elements to make its point. And so many of the gems on this 67-minute CD -- including "Long Lost Tapes of Hendrix" and "That Summer Dress" -- have a way of making one think about N.Y.C. and Ireland at the same time. If you've had a pint or two at Jack Dempsey's on the Lower East Side, but have also strolled along O'Connell Street in Dublin, it's easy to appreciate the Ireland/U.S. connection that is such a big part of Bankers and Gangsters. Black 47, not surprisingly, still have a lot to say about political topics. 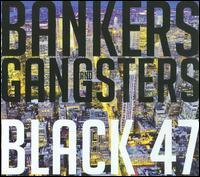 Tracks like "Red Hugh," "Rosemary (Nelson)," and the title song are overtly political, but one of the great things about Black 47 is their ability to get their political points across without coming across as preachy; ultimately, Bankers and Gangsters is a fun album. Black 47 are hardly a bunch of new age Polyannas who see the world through rose-colored glasses -- hell, the band's name was inspired by the horrors of the Irish Potato Famine -- but even when they delve into dark or troubling subject matter, they have a way of encouraging hope rather than despair. With the excellent Bankers and Gangsters, Black 47 remind us that substance and a sense of fun are by no means mutually exclusive. Prices on fye.com do not reflect pricing in f.y.e. retail locations.